Since its inception, Fruits der Mer has been releasing an annual exclusive members only release. To qualify as a member, all that you have to do is purchase all FdM releases for the year directly from the label or Heyday Music. In past years, the FdM annuals have been a cassette and a single or double vinyl 7-inch set. This year Keith has once again outdone himself. A Momentary Lapse of Vinyl is a double CD of 30 bands and Pink Floyd covers from their pre-Dark Side of the Moon days, which I assert was their best and most creative period. 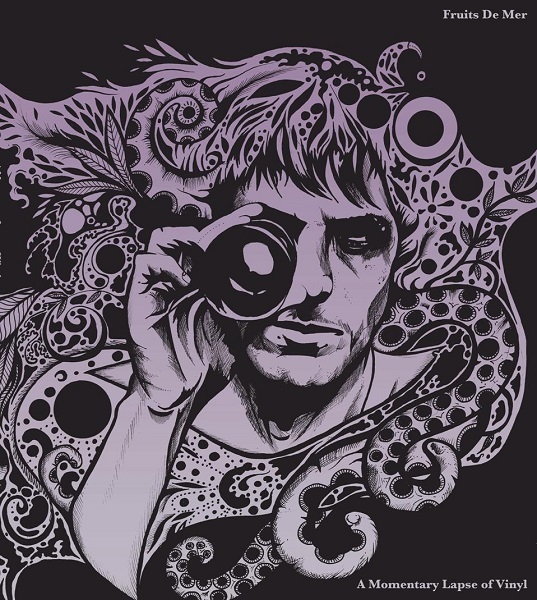 The songs are a mix of Syd Barrett’s solo work (“Golden Hair,” “Dark Globe,” “Terrapin,” and “Dominoes”), early Pink Floyd singles (“Candy and a Currant Bun,” “Apples and Oranges,” and “See Emily Play”), the “classics” (“Set the Controls for the Heart of the Sun,” “Cirrus Minor,” “A Saucerful of Secrets,” “Grantchester Meadows,” and “Interstellar Overdrive”), and many others. Each band was given full freedom to choose the song they wanted to cover. I am sad that no one attempted “Astronomy Domine” or “Careful with that Axe Eugene.” One of the great things about these FdM annuals is that they contain music by existing FdM bands (e.g. Ilona V, Chemistry Set, Vespero, Sendelica, Vibravoid, and Crystal Jacqueline) and newly discovered artists (e.g. Max Kinghorn-Mills, Wild Pink Yonder, and Interstellar Emily). This set seems to be very different from other Pink Floyd tribute compilations. Perhaps it is due to the FdM bands not trying to sound polished, but instead retaining the 60s/70s psych vibe that pervaded early Floyd. The Chemistry Set’s cover of “See Emily Play” is simply astounding, with a surprise integration of the Beach Boys “Heroes and Villains”! I cannot begin to tell you about all 30 songs, that would take a book! There is nearly two and a half hours of music here. So let me touch on the familiar tracks. The Magic Mushroom Band’s cover of “Set the Controls for the Heart of the Sun” is a hypnotic and trippy reading of this classic song. Mordecai Smyth’s “Candy and a Currant Bun” is a lecherous treatment of Floyd’s single. Brooklyn’s Sky Picnic’s cover of “Apples and Oranges” is actually trippier than the original! And my favorite band of 2014, Octopus Syng presents a superb cover of “Flaming” from the first Floyd album. “Grantchester Meadows” is the perfect vehicle for Crystal Jacqueline, who outdoes Roger Waters. Newcomer Rob Gould covers “A Saucerful of Secrets” with prepared piano, electronics, and other syncopated random sounds that more than merely pays homage to the original. The tubular bells clinch the deal for me! “Interstellar Overdrive” has been covered so many times in the past that is hard to imagine someone breathing new life into this song, but Interstellar Emily apparently have closely studied the original and nearly recreated it for the 21st Century. And to close the set, we have the German psych/Krautrock masters Vibravoid and their unique cover of “Chapter 24,” that is more like Jan Kaczmarek’s Waiting for Halley’s Comet than Pink Floyd. So, if you are not an FdM member, the good news is that some of these great covers will released as limited edition vinyl singles next year, but only available at either of the two 2015 FdM festivals.